Introduction: Primary splenic cyst is a relatively rare disease, and the majority of cases are classified as epithelial cysts. Non-parasitic cysts are classified as primary (true, epithelial), lined by an epithelial cover (epidermoid, dermoid, and mesothelial) or endothelial cover (hemangioma, lymphangioma), and secondary (pseudocysts, non-epithelial), which are usually post traumatic in origin. Laparotomy with splenectomy has been the method of choice for the treatment of primary splenic cysts. 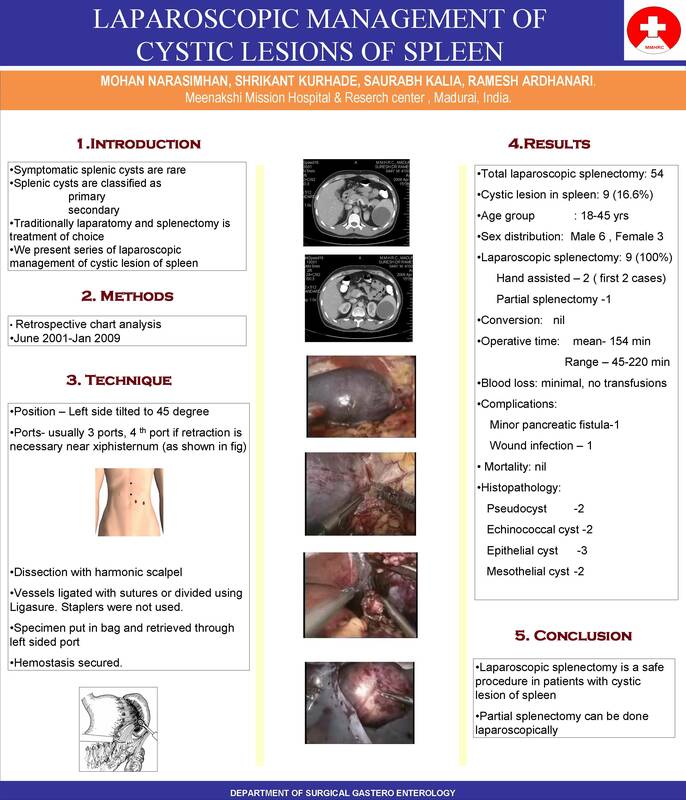 Herein we present our series of laparoscopic management of cystic lesions of spleen. Materials & Methods: Retrospective chart analysis of all cases of laparoscopic splenectomy were analysed between Jun 2001 – Jan 2009. Preoperative presentation, investigations, intra-op & post op outcomes were analysed. Results: Total of 54 patients underwent laparoscopic splenectomy during the period. 9 patients had cystic lesions of spleen (16.6%). Out of this pseudocyst were seen in 2 cases, echinococcal cyst in 2 cases, epithelial cyst in 3 cases & mesothelial cyst in 2 cases. The age group varied from 18-45 years, 6 males& 3 females. CT Abdomen was done in all cases. All patients underwent laparoscopic management. HALS was used in the initial 2 cases, one patient underwent partial splenectomy. Complication was seen in 14%, no mortality in present series. Conclusion: In conclusion, splenic cysts larger than 5 cm or symptomatic ones should be treated surgically, trying to preserve as much of splenic parenchyma as possible. laparoscopic Partial splenectomy can be performed safely in polar lesions.